In honor of my DIVA blog challenge going on this week, I thought it was time for another Vintage Actress feature. 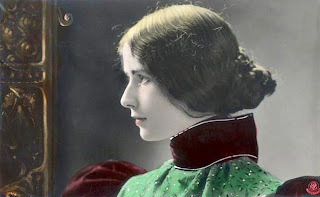 We have so many beautiful photo postcards of Victorian Edwardian actresses and dancers in our Ladies Photos collections, and maybe you'll enjoy knowing a little more about these famous ladies of the stage. I'm working on a collection of just actress and showgirls, organized alphabetically so you can find all the images of each lady together. Many will recognize the unforgettable face of Cleo de Merode. She was born Cléopatra Diane de Mérode on September 27, 1875, in Paris, France, the daughter of the Austrian landscape painter Karl Freiherr von Merode, part of a famous Belgian noble family. She began her study of dance at age eight and made her professional debut at age eleven. 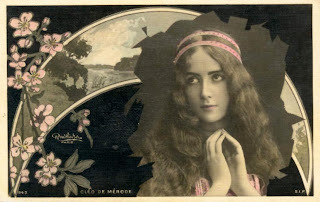 Cléo de Mérode quickly became known for her beauty and glamour even more than for her dancing skills, and at a young age her image began appearing on postcards and playing cards. A unique new hairdo she choose to wear became the talk of Parisian women. She was also noted for her tiny waist which was accentuated by the tightlacing that was popular at the time. Sculptor Alexandre Falguière used her as the model for his sculpture "The Dancer," which today can be seen in the Musée d'Orsay in Paris. Several famous artists of the day painted her portrait. In Vienna her beauty caught the attention of painter Gustav Klimt. In 1896, 61-year-old King Léopold II of Belgium saw Mérode dance in the ballet and became enamoured with the 22-year-old performer. Gossip started that she was his latest mistress. Because the King had two children with a woman reputed to be a prostitute, Cléo de Mérode's reputation suffered because of the gossip connecting her to the king. Despite these whispers of scandal, Cleo became an international star, performing across Europe and in the United States. At the peak of her popularity, she chose to dance at the famous cabaret Folies Bergères, taking the risk to do something other elites of the ballet had never done before. Her performance gained her a whole new following. Very popular in her ancestral homeland of Austria as well as in Germany, she appeared in the 1926 German motion picture "Frauen der Leidenschaft." Mérode continued to dance until her early fifties when she retired to the seaside resort of Biarritz in the Pyrénées-Atlantiques area of France. In 1955 she published her autobiography, "Le Ballet de Ma Vie." Cléo de Mérode died in 1966 and is buried in the famous Père Lachaise Cemetery in Paris, where you will also find the tombs of other famous artists including Frederic Chopin, Oscar Wilde, Honore de Balzac, Delacroix, Moliere, Proust, Gertrude Stein, Edith Piaf , and Jim Morrison. Winner of BIRDS Blog Challenge! Bright Birds Tag from Vicki!